"There's a way to limit your kid's access to mobile phone apps on Samsung Galaxy S5 smartphone. Thanks to the Kids Mode service for making this possible..."
It is inevitable for kids to use mobile phone at home with or without their elders' or parents' permission. This is mainly the reason behind the release of restriction services including Kids Mode for the new Galaxy S5 handset. Kids Mode however was not originally rolled out with the final device build, which means you have to install then enable it before you can use it. Step 1. Download and Install Kids Mode. Before you install the service, you have to enable the "Unknown Sources" option on your phone. Simply go to Settings the select Security. Finally, put a check mark next to Unknown sources. 1.1. Download Kids Mode File from here. 1.3. 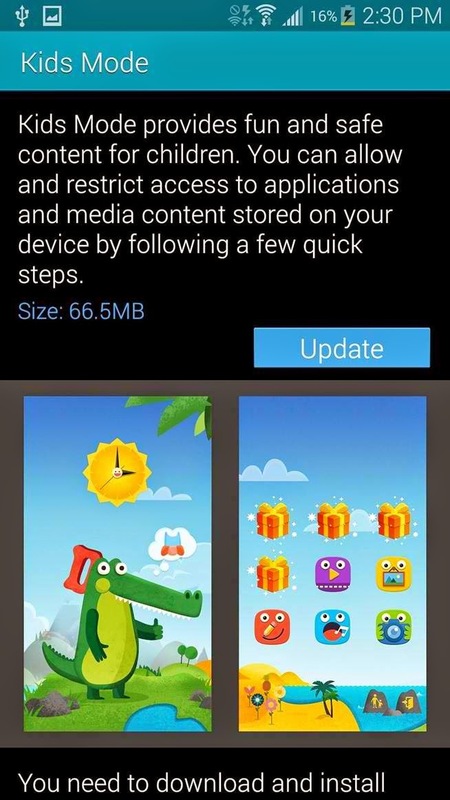 Once installation is complete, launch Kids Mode application to allow the app installs other necessary files by itself. 2.1. Once other necessary files were successfully downloaded and installed, hit the Home button. 2.2. Select TouchWiz Home or any other third-party stock launcher you have. (This is recommended considering you don't want to set Kids Mode as default. 2.3. Open your app drawer and launch the application. * Set new PIN and password. * Assign a Kid's Profile for your kids, and then set permission to the apps you want them to access later. Continue to step 3. Step 3. Take a tour and navigate the New Landscape. You also need to see how the app looks upon launched. 3.1. Start with the Home screen and swipe once to the right. Doing so will show the clock widget and a dino-alligator image/figure. 3.2. Tap on the dino-alligator image and let your child decide on how they’d like to customize its appearance based on their preference. 3.3. Go back to the main Home screen. You should now be seeing the apps you have allowed in little gift boxes. 3.4. To unlock these small gift boxes, tell your child to tap on them. Hint: The gift boxes are usually accompanied by five standard applications including Media Player, Sound Recorder, Camera, Gallery and Doodle app. Continue to step 4. 4.1. Go back to the main Home screen of your device. 4.2. Look for two icons to the bottom of the screen. Each of these icons would require your PIN to access each Settings. 4.3. Enter your PIN and verify and/or modify settings when necessary. 4.4. Once verified/modified, tap on Exit. Once you've hit Exit, you will be routed out of the Kids Mode and go back to your normal launcher. To keep track on later activities, add more apps, enable media, download more apps and set play limits, simply get to the Settings menu to configure certain items appropriately.